With fall on the horizon, we’re seeing more broccoli, cabbage, cauliflower, and beets at the markets, and this week we cooked some of them up. This is a simple preparation where the balsamic vinegar cooks down to a semi-sweet glaze, and also counteracts some of the beets’ earthiness. 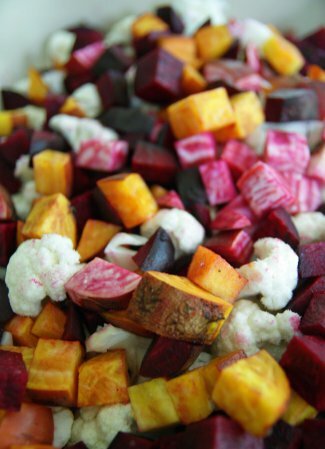 And of course, if you can get your hands on some pretty vegetables, it makes the end result that much better! Combine everything in a large bowl, mixing to ensure everything’s pretty well coated. Place in a large baking dish, and bake for 50-60 minutes at 375 F, testing for tenderness and adjusting cook time accordingly. Beets are notoriously slow to cook – when you think they should be done (and most other vegetables are), they’re just starting to get soft. If you really want to speed it up, boil them whole for 10-15 minutes, then dice them and roast. 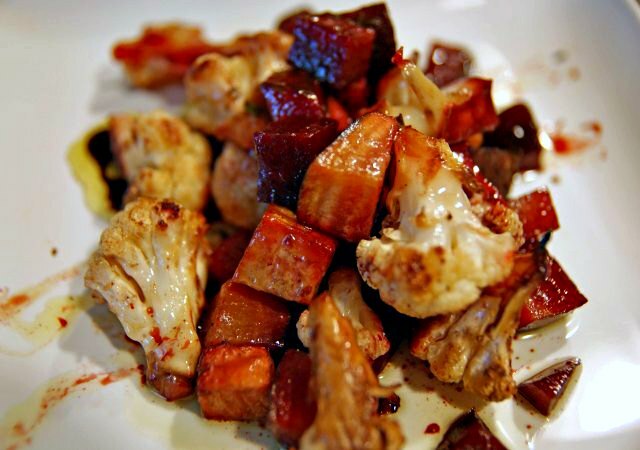 These roasted beets and cauliflower, complete with a balsamic glaze, go really nicely with a heartier meat, like a nice pot roast or leg of lamb. And maybe a glass of red wine. I love the colors of this dish!